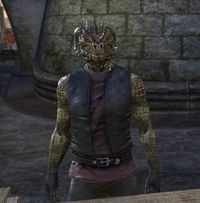 Gilustulm is an Argonian woodworker who can be found in the Canton of St. Delyn the Wise in Vivec City. "Building a city is hard work, but now that I am a free wage-worker, I gladly perform the labors they ask of me." "Since the Pact ordered all slaves to be free, everything has changed. Oh, I still work long hours and get told exactly what to do. But at least now I get paid for my efforts. That makes all the difference." "The blisters that cover my scales remain the same, but now I can nurse them in the comfort of my own home. No more crowded slave pens for me." "I'm free and things are finally looking up for me, and this happens? Why does the swamp hate me?" "I don't think I would have cared about the moonlet falling on my head when I was still a slave. Now that I'm free, I find that life is ever so much more precious." "Now that the city is safe again, I hope they decide to build more cantons. Job security is a wonderful thing for a wage-worker." "The disaster has passed and I've been given a second chance. A third chance? Whatever number this is, I'm eternally grateful." What is it like building the city? "Wood dust may get in my scales, but I do not mind. Sweat washes it away. When the city is complete, I will take my earnings and move to a nice swamp with no Baar Dau and fewer Dark Elves. Maybe start a family." This page was last modified on 9 February 2019, at 04:14.